Corel Designs is an app for graphic designers and basically anyone using images for inspiration in their work. The designs app is made available for Windows 8.1 users. It is very simple to use and quite straight forward. You can go to Corel’s website or directly to the Windows Store and download it. Before you get started, download the app and enjoy the simplicity. Use it for what it is. The simplicity is the key and art of it all. And still, it’s a rather competent and versatile app, no doubt. When working on a project, it is very common to use images as reference material; building up mood boards and what have you. It’s research, and research is a good practice in all sorts of projects. If you are working with a design as an Art Director or Project manager at an advertising agency or in-house at a corporation or organization, then you most probably use images as inspiration and reference. You can never tell when you will get an idea. You may be out on site with a client or collegue. In between meetings or at the local coffee shop when you get a hunch or epiphany. That’s when Corel Designs is there, ready to help you find images from various sources online. You can quickly build one or multiple trays that you can individually name, making it easy to browse around multiple projects. You can browse your various trays, looking at the images you added for inspiration and work. And this way, you can build a project’s concept and mood. Simply perfect when out with a laptop or tablet. The same thing applies to an illustrator, like myself. Let’s say I have a Flickr account of my own. I can take photos with my smartphone and use the Flickr app to upload my photos. I can then go online to my Flickr account and add images to my tray for later viewing. Or, I can simply choose to not place in trays at all, if I like to work on the fly and simply browse images quickly. I can go to the CorelDRAW.com and Corel Painter community gallery section and look at other creators’ work. I can also browse my own gallery. I can go to a content provider such as iStockphoto, Fotolia and look for images. If I then like to use one of the images I find via the Corel Designs app on my laptop or tablet, I simply click the image and get redirected to the content provider website in a browser and pay and use the image that I want to use. 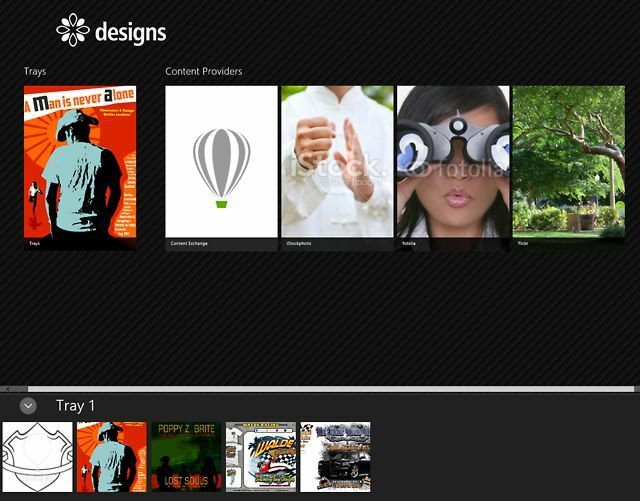 With Corel’s new Content Exchange, I can download content provided by Corel and other content providers and designers. I can view great works by individual artists and designers from both the CorelDRAW and Corel Painter communities. Even the great work by contestants of the CorelDRAW International Design Contest is available. This helps me get inspired and free my mind. If you register a free account on www.corel.com and have a registered Standard or Premium Membership account, you can both vote and favourite the content and have watermarks removed you otherwise would see on content from Corel Content Exchange. Simply sign in to your account. It is a great way of working with images for various projects, and the simplicity makes it easy to work on the fly. Just the way inspiration comes to us, on the fly. I have drawn and painted since I got my first crayons and sketchpad. When I was 13 years old, I decided to be an artist, while learning how to juggle with oranges. I had my first exhibition at a gallery in Old Town in Stockholm, Sweden when I was 21. And my first paid illustration assignment a year or two before that. During this time I have made 5-6 stage sets, scenographys, and several art exhibitions and illustration assignments. And today it’ my work—working as an artist and illustrator. This entry was posted in Graphic design and tagged apps, Corel, CorelDRAW, Designs, graphic design, illustration, mobile, mobile apps. Bookmark the permalink.